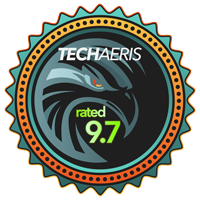 While the majority of review products we get here at Techaeris are from established companies, we do still get our fair share from lesser-known companies as well. James Donkey is one company I hadn’t heard of in the gaming audio space until they reached out about their Tactical Master Kickstarter. They were kind enough to send along a review unit so check out our Tactical Master review to see how this fully funded Kickstarter pilot-inspired gaming headset fares! 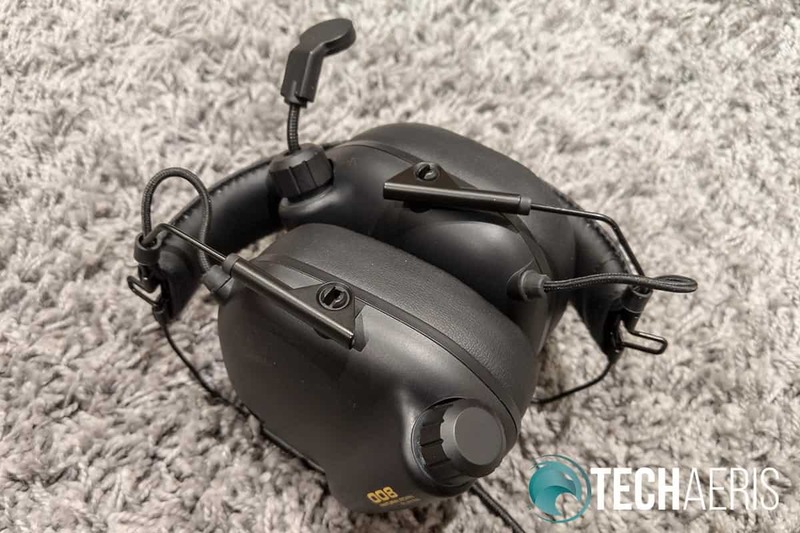 If you’ve ever flown, or flown in, a small aircraft, you’ll immediately notice the pilot-inspired design of the Tactical Master gaming headset. 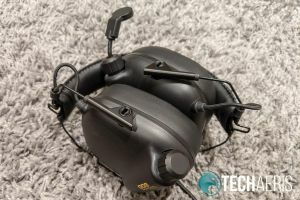 Taking design cues from notable pilot headsets like the David Clark H10-66 and Flightcom E-13 Passive Military headset, as well as throwing in a dash of gaming headset features, the Tactical Master is definite a more unique headset. The Tactical Master gaming headset. 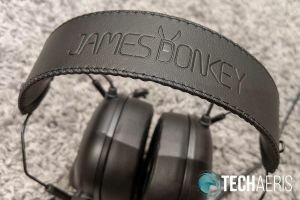 The leatherette headband is rather thin and has the James Donkey logo debossed on the top. Lightly padded on the underside, one can barely feel the cord attaching the two headsets running through it with your fingers but it is unnoticeable when the headset is worn. The edges of the headband are nicely stitched, and the padding is stitched into four different sections. Protruding from either side of the headband is a very thin, metal, u-shaped wire frame which attaches to the earcups by way of a slider. The sliders themselves are slightly thicker and allow the metal frame to slide up and down for easy adjustment. Even though they slide easily, the do stay in place once you have your fit set. 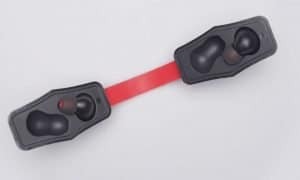 The sliders are attached with small clips which allow each earcup to swivel in towards the headband, allowing you to fold them into a compact package when not in use. 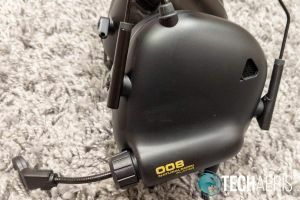 The earcups themselves are almost square in shape, roughly 3 1/4-inches across with the back edge about 3-inches in height and the front edge measuring about 4-inches in height. As a result, the bottom of the earcups angle down towards the front. 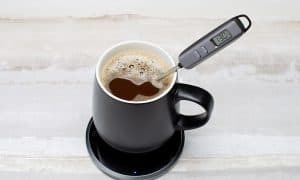 Fairly thin at about 1/2-inch, the bottom of the earcup bulges out in a cylindrical fashion to about an inch-and-a-quarter near the bottom. On the right earcup, this houses the volume knob, on the left the microphone and microphone volume knob. Both knobs are ridged with an LED ring behind them which pulses slowly through various colours. Subtle LED lighting around the volume knobs. The outer shell of the earcup is a hard, durable “Inky Black” plastic. 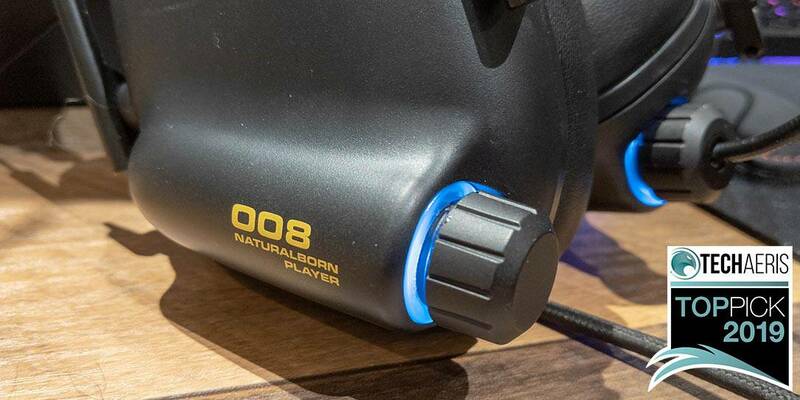 Stamped on the cylindrical regions are the words “008 NATURALBORN PLAYER” in yellow. You can also get the headset in Army Green with white writing and Lemon Yellow with black writing. 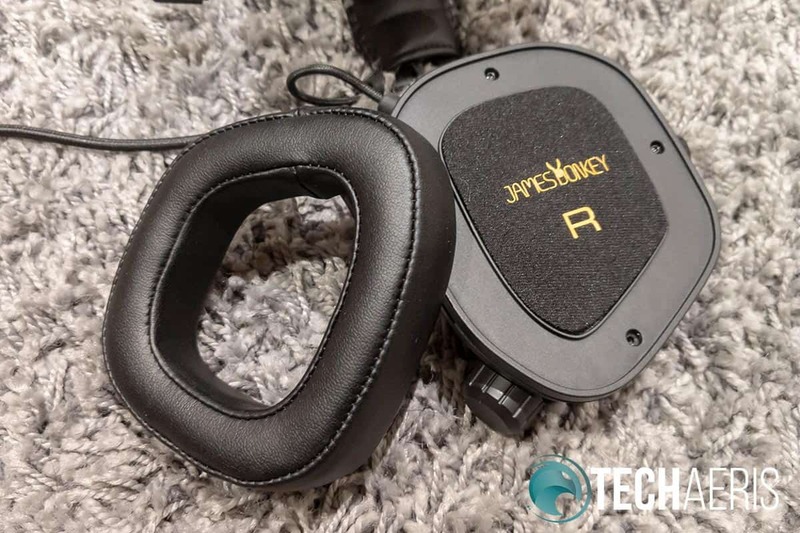 The earpads themselves are similar in shape to the earcups and are crafted from memory foam with the same leatherette finish as the band. 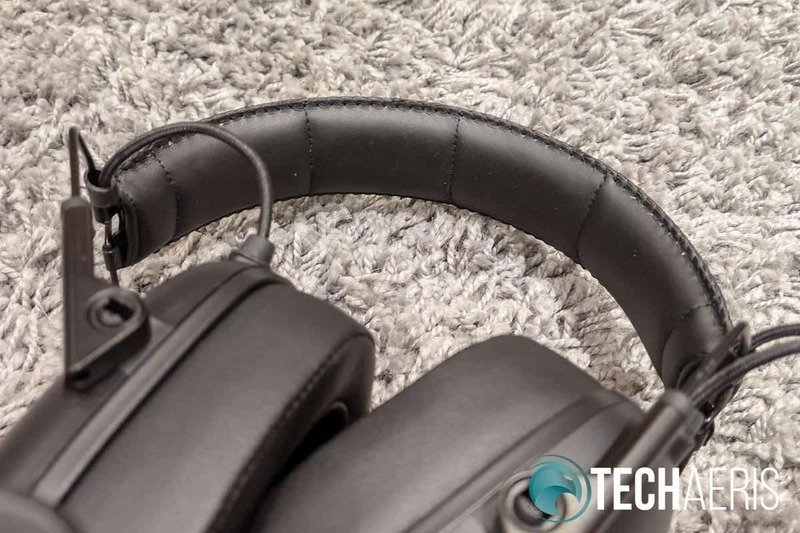 When removed, the earpads are about an inch thick and three-quarters of an inch in width. They are also stitched around the outer and inner edge, giving them a nice look. The back of the earpads are plastic which attaches to the inside of the earcup by way of magnets. Finally, the area covering the drivers is covered with a thin foam/felt-like material with the James Donkey logo and R or L — depending on the side — printed in yellow. The microphone itself is shorter than most gaming headset microphones. Fully extended, it consists of a flexible, one-and-a-half inch metal arm which ends in an angled/circular pilot style mic. Fully retracted, the adjustable arm still sticks out about half-an-inch. To be honest, this is probably my only complaint about the headset as I would have liked to see the mic fully retract. While it doesn’t flop around while retracted, it just looks like it should be able to retract more. Perhaps in a future iteration, full retraction could trigger a mic mute for added functionality. As it stands, you can just turn the mic volume knob all the way down to mute the mic. Also connected to the left earcup, the almost 6-foot (1.8m) braided cable is plenty long for just about any computer set up. At the end is a thin and slightly angled USB-A port for computer connections. Overall, the Tactical Master is easily one of the most comfortable gaming headsets I’ve used, regardless of the length of the play session. Not only is it nice and light (weighing only 9.8 oz/278g), but the memory foam earcups and padded band provide the right amount of padding. The 53mm drivers are a pretty common size for headsets and are angled in towards the front by about 15° for better sound. 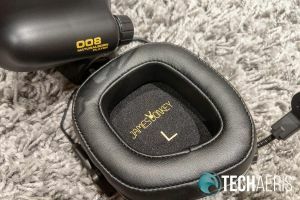 James Donkey states that the reason for this is because the human eardrum lies at an angle so the tilt can better direct sound to into your ears. Regardless, the combination of the angled 53mm drivers and the onboard virtual 7.1 surround sound makes for a fantastic sounding headset, at least on PC. 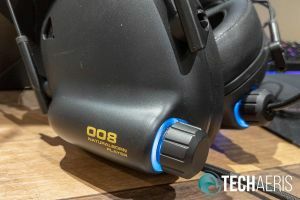 From gaming, which the headset is obviously geared for, to music and movies, the sound quality was crisp, clear, almost perfectly balanced, and totally immersive. The closed-back earcups also provide great sound isolation and even on lower volumes like 14 (on Windows 10), I was hard pressed to hear my typing on the mechanical keyboard. Everything from the sounds of car engines in Forza Horizon 4 to footsteps and ambient noise in Gears of War 4 felt appropriately placed in relation to its location. On the music side, highs, mids, and lows are nicely balanced with almost the perfect level of bass (at least to suit my tastes). There was even one moment when I was playing Forza and listening to Spotify that I actually jumped in my chair because I heard a part of a song that sounded like someone was directly behind me — something I hadn’t noticed the dozens of times I’d heard the song before. 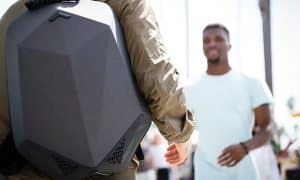 In fact, I found myself raising the volume during music listening while working to further surround myself within it… And on that note, even when at louder volumes, there isn’t a lot of sound leakage so you won’t be disturbing those around you while gaming or enjoying your music. 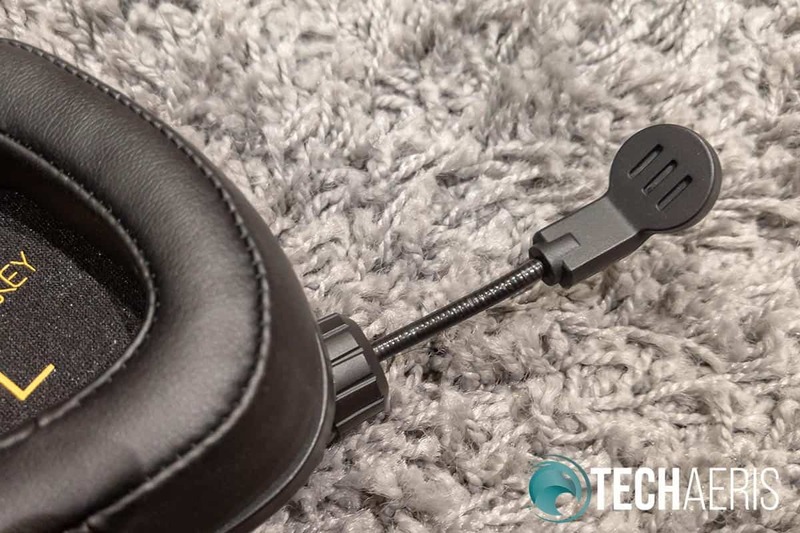 The headset is also compatible with the PlayStation 4, Nintendo Switch, and Android devices. The latter two can be used with a USB Type-C adapter plug which, unfortunately, we didn’t have to test with those devices. Equally unfortunate, the headset isn’t compatible with the Xbox One (how I wish it was) or the iPhone. As far as microphone/voice quality is concerned, I hopped into a few games of Heroes of the Storm to test it out. During the few rounds I found other players to chat with, I was told that it came through pretty crisp and clear. Initially, it was a bit low, but a quick twist of the microphone volume knob on the left earcup fixed that. 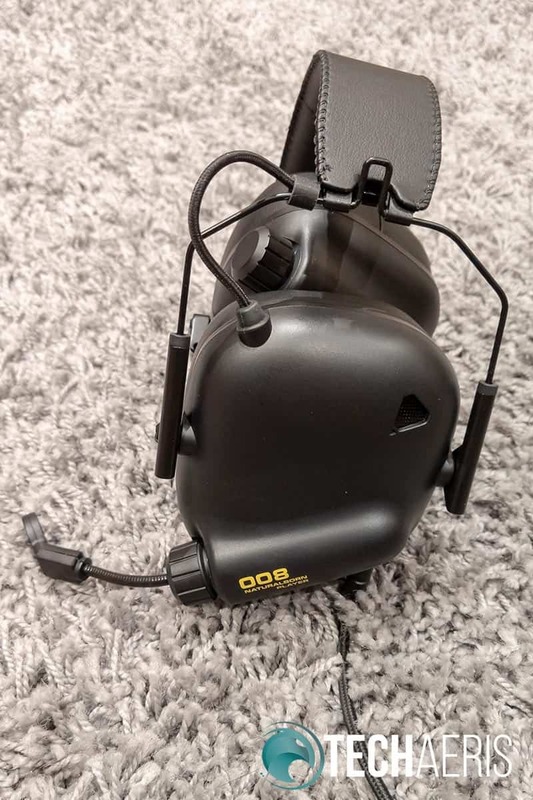 While I couldn’t judge for myself, James Donkey has implemented automatic gain control and echo elimination in the noise-eliminating microphone for optimal voice quality while gaming. The Tactical Master gaming headset will have an MSRP of US$89 when it goes on sale. With a couple days left in its fully funded Kickstarter campaign, there are still a few Super Early Birds left at $49 (45% off) and Early Birds at $54 (40% off). I’d definitely recommend them at the suggested MSRP and this really should be an impulse/no-brainer buy at the Super Early Bird and Early Bird pricing. Deliver is expected sometime in February. While the Tactical Master gaming headset doesn’t look like your typical gaming headset, the lightweight pilot-inspired design is super comfortable and the 53mm drivers provide fantastic virtual 7.1 Surround Sound. Pick one of these Techaeris’ Top Picks of 2019 up on Kickstarter while you still can! 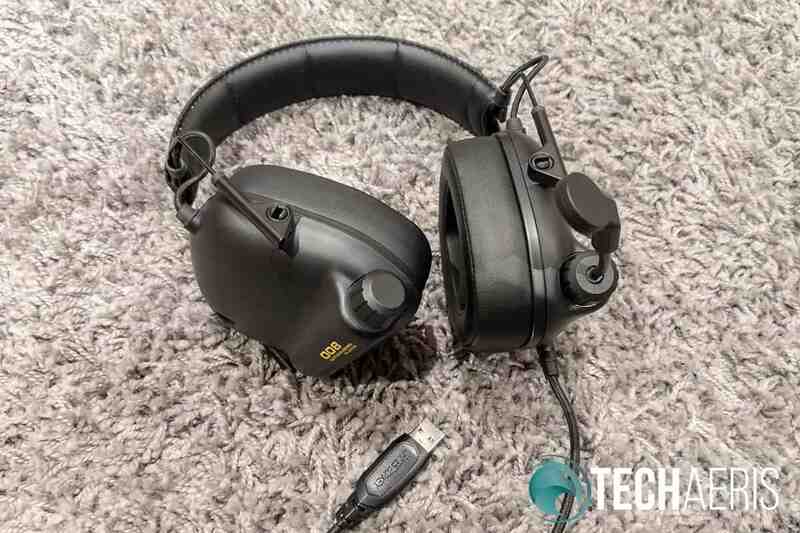 *We were sent a sample of the Tactical Master gaming headset for the purposes of this review.